Jess and the gang: Costco! 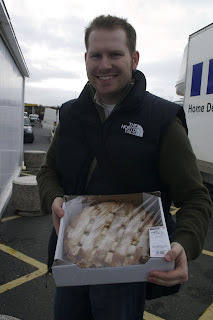 Ian was excited to see the large apple pie, so we picked one of those up. Hopefully it tastes as good as in the states! He also grabbed up some blueberries and bagels. 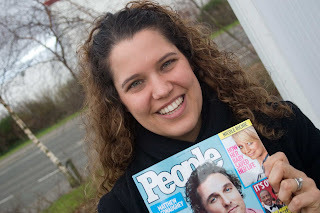 I, on the other hand, went crazy over seeing People Magazine...the US Imported edition! A little taste of home! Right now that feels like a prized possession to me. I also got excited over a huge container of pomegranate seeds. Fruit (and really all food) is really expensive here. I had a fruit cup with pomegranate seeds the other day for 3.15GBP, but for a huge container of these bad boys at Costco, 5GBP was such a great deal! Now, we couldn't pick up much because we did have to carry everything with us on the bus back home (not to mention thru Ikea first), but it still was great to spend a little time at one of America's top institutions! I love Costco! RJ and I visited the Cabo San Lucas edition of the superstore and it was a fabulous experience, as always. Sometimes I'm really glad our economy has gone global! Plus, nothing says USA than People magazines. Enjoy the crossword. It's my favorite part.